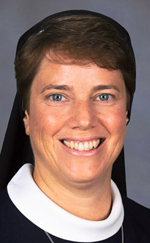 Sister Mary D. Ellis, I.H.M. Sister Mary D. Ellis, I.H.M., died Jan. 17 in Camilla Hall, Immaculata in the 22nd year of her religious life. She was 44 years old. Born in Somerville, N.J., Sister Mary entered the Congregation of the Sisters, Servants of the Immaculate Heart of Mary in 1995 from Immaculate Conception Parish, Somerville, and professed her vows in 1998. Sister Mary taught in elementary schools in the Archdiocese of Philadelphia, and served in Chile and Peru as a pastoral minister and religious superior. Her last assignment was at Villa Maria House of Studies as Directress of Novices for the I.H.M. Congregation. The funeral Mass was celebrated Jan. 22 at Camilla Hall. The principal celebrant and homilist was Msgr. Seamus Brennen. Also concelebrating were Father John Maria Devaney, O.P. ; Father Alexander J. Carles, Father Michael J. Gerlach, Father Joseph McLaughlin, O.Praem. ; Father William A. Trader, O.Praem. ; Father John P. Timlin, C.W. ; Father Joseph Devlin and Father William E. Dean. In addition to her I.H.M. congregation, Sister Mary is survived by her loving parents, Edward and Marjorie Slear Ellis, her brothers, Thomas (Katharine), James, Paul (Trinh), Mark (Sydney), her sisters Kathleen Ellis, Ann Woolley (Hunter), and many loving nieces and nephews.